I have always said that I think everyone, should work a retail or restaurant job at some point in their lifetime. These jobs provide important life skills, that I strongly feel get left behind and are often not ‘taught’ else where. Like being on time, money management, cleaning skills and being nice to others; just to name a few. For me one thing I learned was being meticulous about every detail. When I worked retail, I had to ‘walk the aisles’ making sure everything was in the right place, pulled to the front of the shelf and straight. To this day, you can often catch me adjusting an item on a self (at a store I don’t work at) to make it looks perfect. With the restaurant jobs, I learned about proper place settings (I am sure my Southern Mom who taught us etiquette and proper place settings as children, is gasping right now… that I didn’t listen to her all those years ago) and how even though dirty dishes were put through the clean dishwasher using restaurant strength dishwasher detergent, there could be ‘spots’ left behind. You see, if you have ever worked in a restaurant then you know all about polishing silverware and wine glasses. The dreaded task of polishing is because of all those water and detergent spots left behind by the industrial strength dishwasher. I can’t even begin to tell you how many years of my life were spent holding wine glasses over pitchers of steamy water and carefully rubbing away any spots with a crisp black linen (not white because white linens can sometimes leave fibers). Just like the obsessive straightening of products on store shelves, I can’t let dinner (especially a dinner party) at home or out on the town pass with ‘spotted’ dishes! Clean, beautiful dishes are a must (hello… I’m a food blogger!)! I learned early on in blogging, that I didn’t have time or want to spend time doing dishes all day. I would rather be cooking, photographing, writing or engaging with you all on social media! However, the truth is, most days I am loading the dishwasher at least two, sometimes three times a day! Rewashing and polishing dishes, well forget about it. 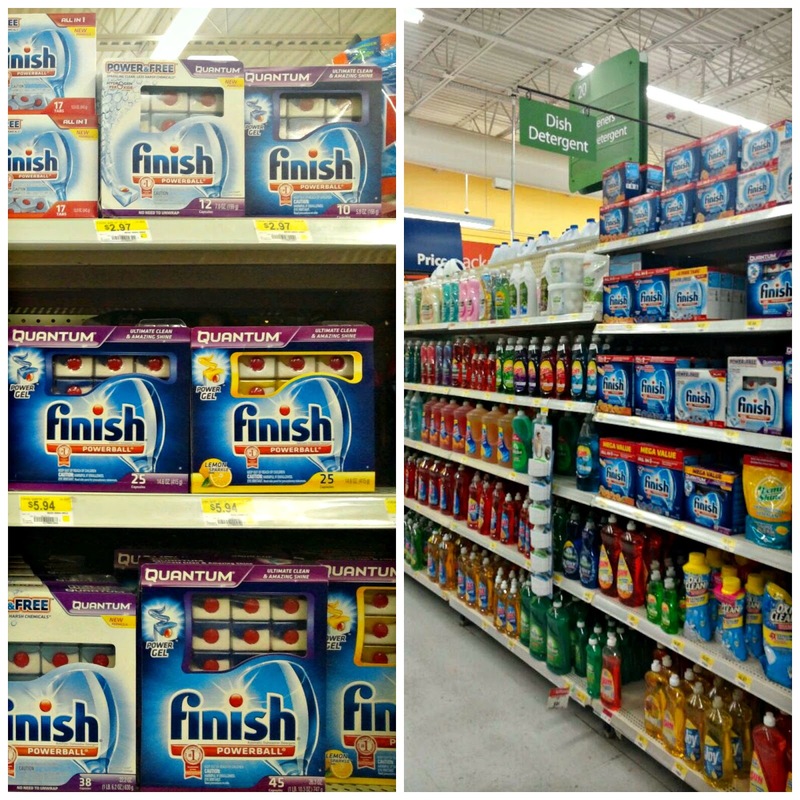 That is why I am so happy I discovered Finish dish detergent at my local Walmart so many years ago! Seriously, my kitchen, this blog, could not run without that stuff! My dishes come out sparkling clean every time (even with the hard water we have) with no spots or residue… which means I can do more of what I love best…. cooking, creating and hosting fun themed dinner parties! After my apple dinner party a few weeks ago, I have been toying with the idea of having a another fall themed dinner party. My brother-in-law suggested pumpkin, and the wheels in my head immediately started turning! 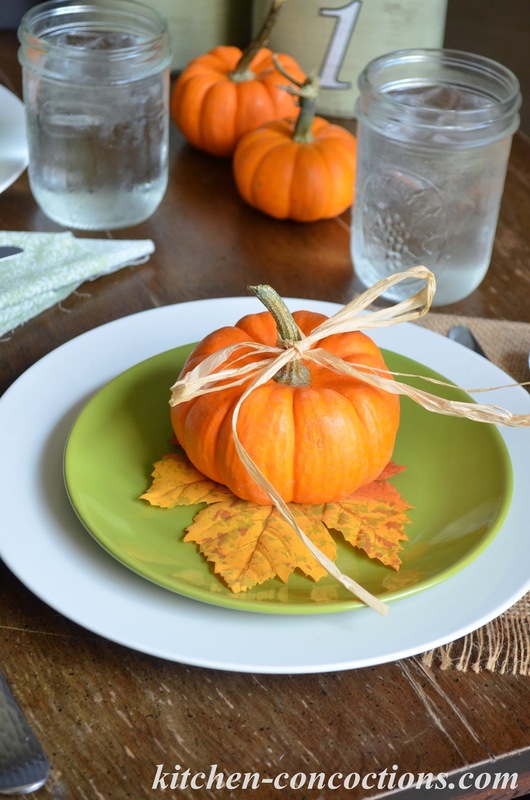 Oh the possibilities for a pumpkin themed menu, tablescape and place settings! 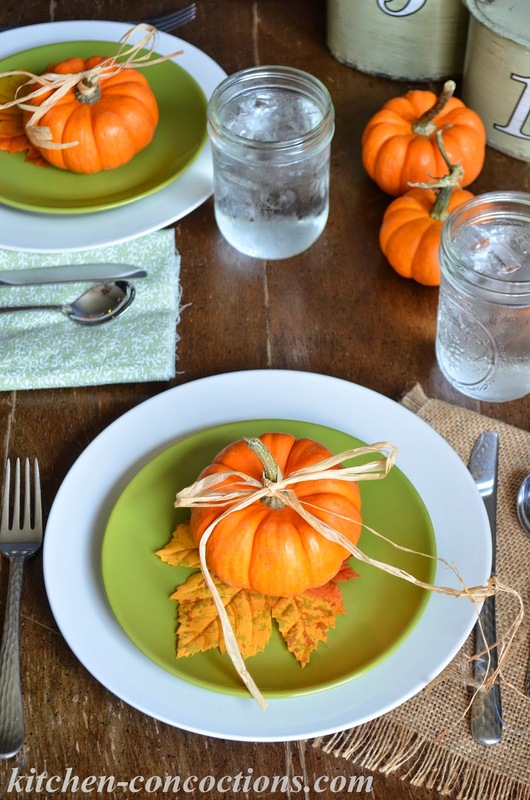 Even though our official pumpkin dinner party isn’t for a few more weeks, I started testing recipes and pulling out my sparkling clean dishes to play around with place settings. I instantly fell in love with this large white plate with smaller green plate combo. 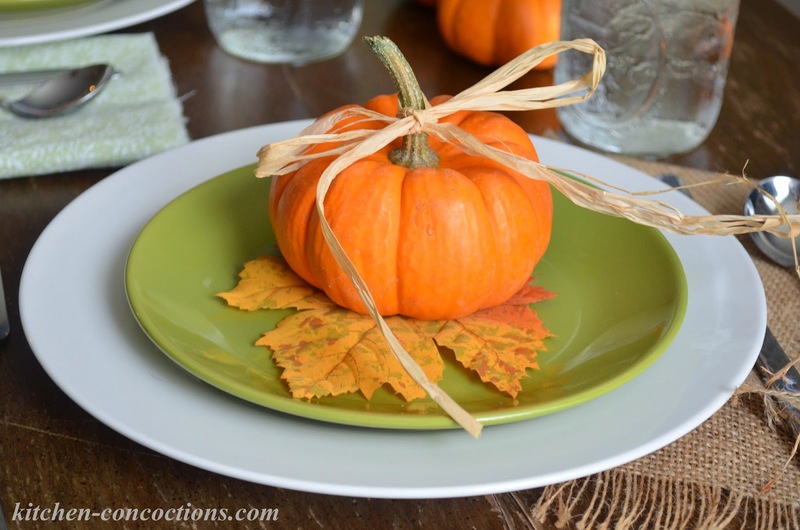 Topped with a real (or silk in my case since it is still 90+ degrees here) fall leaf and a cute mini pumpkin… well I just couldn’t help myself and sequel with excitement! I am loving these themed dinners and am now I uber excited for this one! As far as our menu? 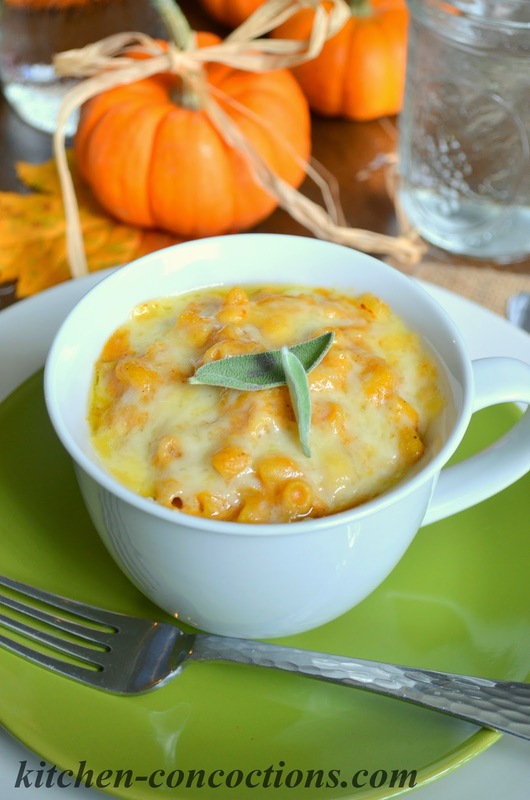 Well I think a popular comfort food with a fall twist is calling our name! This Brown Butter Pumpkin Mac and Cheese is full of cheesy goodness and has a lovely, nutty autumn flavor… perfect for the much anticipated first day of fall. A fall twist on a classic comfort food! Preheat broiler to high heat. Bring a large pot of salted water to a boil. Add macaroni and cook. As directed, for 6-7 minutes or until tender. Meanwhile, place the butter in a heavy bottom saucepan and cook over medium heat, stirring constantly, until the butter begins to boil up and becomes foamy. Continue cooking and stirring until butter starts to smell nutty and turn golden or toasty brown in color, about 6-8 minutes. Slowly stir in flour and stir for 1 minute. Stir in milk, stirring until fully incorporated and thickened, about 2-3 minutes. Stir in salt, pepper, nutmeg, mustard powder, cayenne pepper and pumpkin puree. Add 1 cup each of white cheddar and fontina cheeses; stirring until the cheese is melted. Drain macaroni, reserving 2 tablespoons of starchy pasta water. Add 2 tablespoons pasta water and cooked pasta to cheese sauce, and stir until well coated. 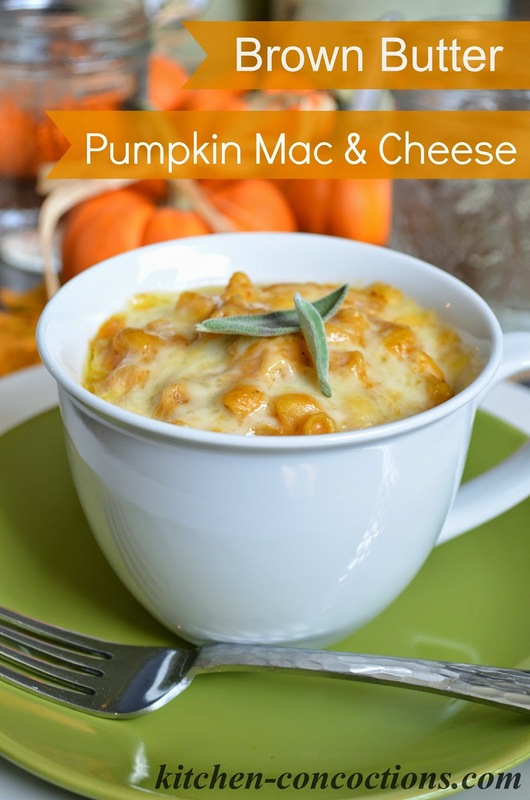 Pour pumpkin mac and cheese into an 8×8-inch square casserole dish or individual ramekins. Top with remaining cheese. Broil until cheese is bubbling and brow. Serve topped with fresh sage or a dash of cayenne pepper, if desired. Don’t waste anymore time or money doing dishes! Combine this coupon with Walmart’s Rollback prices (good through October) and grab some Finish at sparkling savings! That looks like an amazing cup of comfort food. YUM!